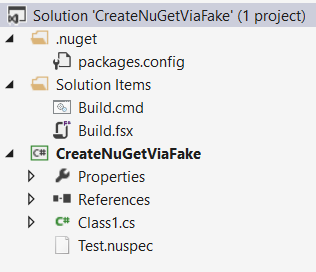 FAKE has at least two approaches to build NuGet Packages. The first approach is that you define a NuSpec-Template and fill the missing pieces during the build via FAKE. This scenario is covered here. The second on is “simpler”, at least for me (but… you know… I have no idea how to write real F# code): You just need to manage your .nuspec manually. Currently I use this approach, because I can handle everything inside the .nuspec files and can still use FAKE for the build process. The sample project consists of one class library project and the .fsx file. Important here are the required NuSpec meta fields and the files section. If you are not familiar with the .nuspec syntax, take a look at the reference. Nothing special - we just build the library and the output will be stored in our artifacts/build folder. The built-in NuGetHelper will invoke nuget.exe with the given nuspec. We set the WorkingDir to the output of the other target and set the OutputPath to another location. The version handling is a bit complicated, because of this issue. The default Version is 1.0.0 and FAKE will currently ignore the Version-Information inside the .nuspec. The workaround is: Parse the .nuspec and get the version number and pass it to the NuGetHelper. Easy, right? The NuGetHelper from FAKE has some pretty nice functionality built-in, for example you can publish to NuGet.org with a given access key. For a more complete solution around consuming and creating NuGet Packages take a look at Paket. For my simple use cases FAKE was “good enough” and I hope this might help. You can find the complete sample & build script on GitHub.